UV Pools is a leading Winnipeg pool company that specializes in pool renovations, pool liner replacements, and pool repairs. At UV Pools, we want to make you love your pool again. Whether you use your pool for everyday fun, or relaxing in the sun, your pool should be a source of enjoyment – not a headache. Taking on a pool renovation project can seem demanding. 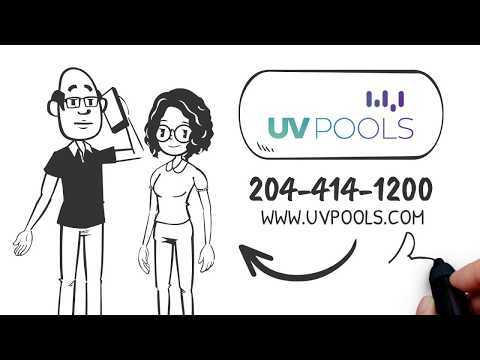 But as you’ll see in this fun video, that’s not the case with the friendly team at UV Pools. We take the stress out of your pool renovations every step of the way. Be like Gary and Tina, and fall in love with your pool all over again! When your computer is broken, you call a computer nerd. When your pool needs a repair, a new pool liner, or a renovation, you call a pool nerd. UV Pools is the brainchild of Dale Kreviazuk, who has been living and breathing pools in Winnipeg so long he may have gills. Wait forget that, we don’t want him to be taken away from us by people who want to study his superpowers. If you want to take your pool from zero to hero for less than the cost of filling it in, contact us today and have Dale over for an estimate. What does your pool look like? With the use of pool safety covers, you can turn your summertime oasis into a beautiful and safe winter surface. With the use of a mesh pool safety cover, your backyard will be a safe space for children and pets all year long. These mesh covers can be walked on by adults, kids, and pets, as they can support thousands of pounds. These covers are anchored securely using stainless steel springs and brass anchors, that our professionals drill directly into your concrete deck. Your pool safety cover can be installed in less than 15 minutes by two people. When spring arrives, you won’t have to worry about a messy cleanup. The winter snow melt filters through the mesh cover, leaving any debris or leaves on top of the cover, which will blow away with a good gust of wind. The way that your pool looks when it is covered in the fall is exactly how it will look when spring comes, which is a welcome change as compared to traditional tarp-style blankets. Solid pool covers are often described as safety covers, but are composed of a solid material. We call them solid pool covers, as they create a solid barrier between your pool and the surrounding environment. By using a solid pool cover over winter, your pool will stay safe from debris, and make the spring clean up much easier without decomposing leaves or organic debris. These solid pool safety covers are held in place with brass anchors, drilled directly into the concrete. These anchors hold the cover tight, and provide space for a beautiful backyard, all winter long. The brass anchors can be screwed down for the summer months, ensuring the removal of all tripping hazards. Our solid pool covers are available in a variety of attractive colours, to best suit your backyard decor. These covers also come with a solid, 15 year prorated warranty. Retractable automatic pool covers offer both convenience and safety, amongst many other benefits. Retractable auto covers help pool owners save money on heating and chemical costs, as when a pool is sealed off, the heat stays in, and debris stays out. With the touch of a button, you can effortlessly open or close your pool in under a minute. Knowing that your children are safe around your pool is a priceless benefit of what automatic pool covers provide. These covers operate without any other input or effort from the user. UV Pools offer many different styles of automatic pool covers, meaning that your pool does not have to be a rectangle shape to install an auto cover. Our automatic, retractable safety covers offer the best warranty in the industry, and are crafted from marine grade stainless steel. Rubber paving is a safe, popular paving in Winnipeg, becoming increasingly more used over the last 5 years. UV Pools offers a product called Rubaroc, which is a high-quality, top of the line synthetic paving surface that is used around pools. Rubaroc transforms the look of your backyard and pool area, while increasing safety with its slip-resistant grip, even when it is wet. Rubaroc is extremely comfortable to walk on, and will not overheat in the hot summer sun. Rubaroc is made of synthetic EPDM, which has been ground into small granules. These granules are mixed with high-quality UV resistant urethane, and troweled into place on the surface you need covered. Creating a permanent bond between the substrate and newly applied rubber surface is key to its longevity. All Rubaroc products come from Europe, and are of the highest quality. Rubaroc has a great track record within Canada, having been provided for over 25 years. UV Pools applies Rubaroc rubber paving over cracked concrete, allowing us to cover up ugly cracks, or damaged concrete. These cracks will not further damage the Rubaroc, as it is an extremely flexible material. This durability and flexibility means that Rubaroc will not crack, even during our harsh Manitoba winters. Many concrete pool surroundings in Winnipeg have some sort of crack, as concrete tends to crack easily. Rubaroc can protect your pool surround, while increasing visual appeal to completely transform the look of your backyard. Enjoy the safety and efficiency that Rubaroc rubber paving can provide! UV Pools offers inground swimming pool liners, custom made to fit your pool like a glove. Our liners are exclusively made in Canada, from top of the line vinyl material, also crafted in Canada. Canadian vinyl material is of the highest quality, and is 30 millimeters thick, which is the ideal thickness for an inground pool. We offer over 40 pool liner patterns to choose from, to ensure that you find a pattern that best suits your personal tastes. The liner replacement process begins with an on-site consultation to evaluate your pool, and address any concerns you may have. We inspect your pool on our first visit, to detect any possible problems that may have previously gone unnoticed. From there, we provide a written estimate from which you can make the best decision for your needs. Providing that you want to proceed with your pool liner replacement, we obtain detailed measurements, and get your custom liner on order right away. Our pool repair experts at UV Pools can repair pool leak issues underwater, eliminating the need to empty your pool, and saving you money. If you suspect a leak in one of your pool pipes, we have specialized equipment designed to detect leaks, and pinpoint their exact location underground. If you have a leak in your pool liner, we can usually fix this issue underwater. Our trained divers use scuba gear and a special chemical adhesive to patch your liner, all while working underwater. If your pool liner is bubbling or floating, this may be a sign of a leak somewhere that requires a pool liner repair job. Pool coping will get brittle with age, and may need to be replaced after it has cracked. There are many forms of pool coping, and we carry many styles. UV Pools is also able to repair pool steps, lights, and damage from hail or storms.